Ric Chandler is a very versatile drummer, percussionist, Programmer and Musical Director, who has worked both live and in the studio with a wide range of artists and producers. Calvin Harris (Sony/Bmg) Tricky (Epitaph), Frank Musik (universal) Chris Loung (Nigel Kennedy)(EMIClassics)) Amy Studt (19 Management/Polydor) Gary Numan (Artful), Un-cut (Warner Music) Rico (Chrysalis. ), Jimmy James (& The Vagabonds), The High Fidelity /Soup dragons, (Arista. ), Matthew Jay (Parlaphone.) Tam (Roadrunner), Brian Robertson, (Thin lizzy), Imogen Heap (Island). Swati Natekar (Craig Armstrong, Nitin Sawhney) Soma records (Silicone Soul) Sidewinder (Soma), The Jazz Collective & Dom Brown (Duran Duran) & many other Artists. Tim Goldsworthy (Primal Scream/Uncle/DJ Shadow). 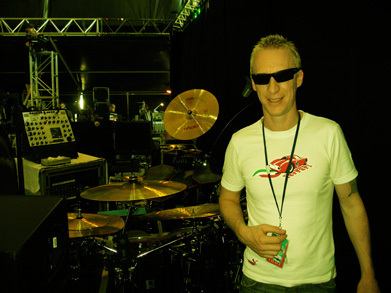 Jim Abbiss (Sneaker Pimps/Lamb/Massive Attack). Joe King (Radiohead/Steveie Wonder/Tindersticks). Ray Schulman (Roadrunner /Various Artists). John Leckie (Radiohead/Muse/Pink Floyd). Gilbert Gabriel (Dream Academy/Various Artists). Ric Pete (Charlatans/Six by Seven/Muse). Matt Ellis (Louise/Rico/Various Artists). Ian Jones (Metallica/Faith No More/EMI USA). And many others.